Finally I got some semi decent photos of my challenge-not great but at least you can make it out. The detail shot shows the truest colors-it looks better in person if I do say so myself, as the textures really show up! 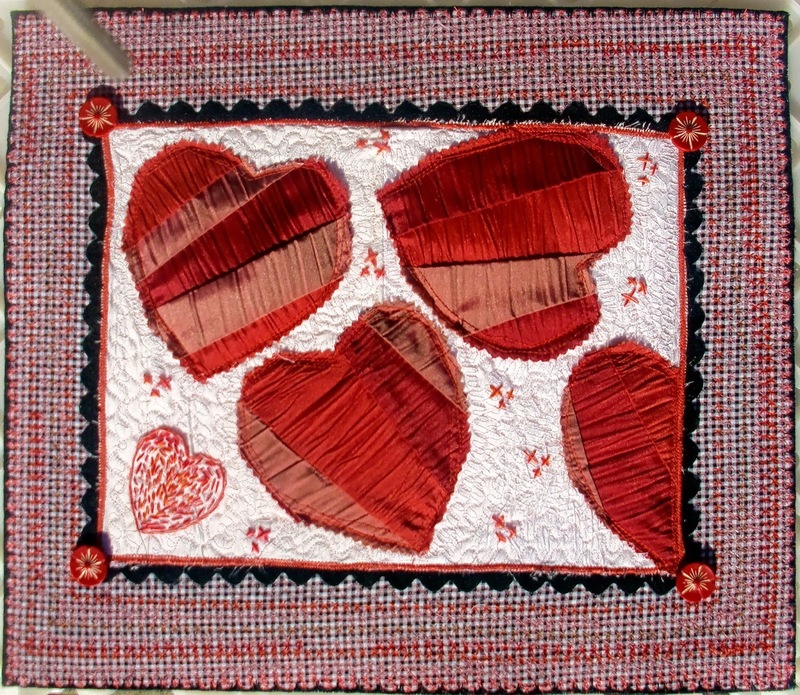 I continued to play with the decorator wrinkly fabric for both the hearts and the white background. I used lots of techniques in this one and have been trying to stick to my CREATE-ive mission for 2014! I loved the redwork that Sophie (Sophie Junction)was doing so I decided to do some handwork on my piece. I had forgotten how much I enjoy it! I had fun, learned stuff , had to troubleshoot and find solutions to little issues that popped up along the way. In the end it turned out nothing like I had planned but I like it! Love the wrinkly hearts - lots of texture! I have also begun to play with decorator fabrics - lots of challenges, but your piece shows that can be mastered. Love the hearts and the border. Great finish. It is fun to just see how things turn out. Its great that you just went along with it. Thanks for sharing your process and your thoughts. I have been using some designer fabrics from a sample book that I got, mostly using them for backing small projects. For me this piece has an antique feel ... something treasured ... I love it! I like the way you have used textured fabric and the hand-stitching, it's something different.